Hi loves! How are you doing, and how's your weekend so far? Last night the boyfriend and I went to see Maleficent.. it was amazing ♥! Angelina Jolie is SO perfect for the role, and her make up and outfits are super gorgeous too. Today I have some fun nail art to show you. Lately, all I've been posting are reviews and such and I am not being ungrateful for the opportunities, but every once in a while a girl has got to do some nail art, right? So earlier this week I sat down and thought about what to do, but I was completely uninspired lol. I ended up doing the one thing I can always do pretty: leopard print :-D! The first polish I picked to work with was Rimmel Pillow Talk which is part of the Rita Ora collection. Ever since seeing the gorgeous swatches Emily did, I had to have some of these shades! Rimmel Pillow Talk is a pastel baby blue but not too light, there is still some decent pigment in this shade. 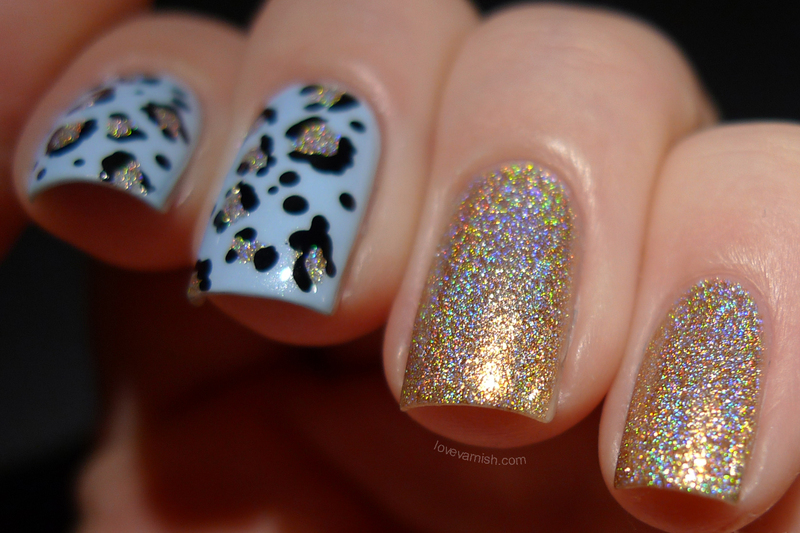 In the bottle you can clearly spot shimmer, but on the nails it almost completely disappears. I still like the shimmer in it though, it helps with the formula being easy to handle. 2 coats are all you need with this polish and it dries quite quickly too. On my ring finger and pinky I used 3 coats of F.U.N Lacquer TGIF, the bonus shade from the upcoming summer collection set to be released June 23rd. 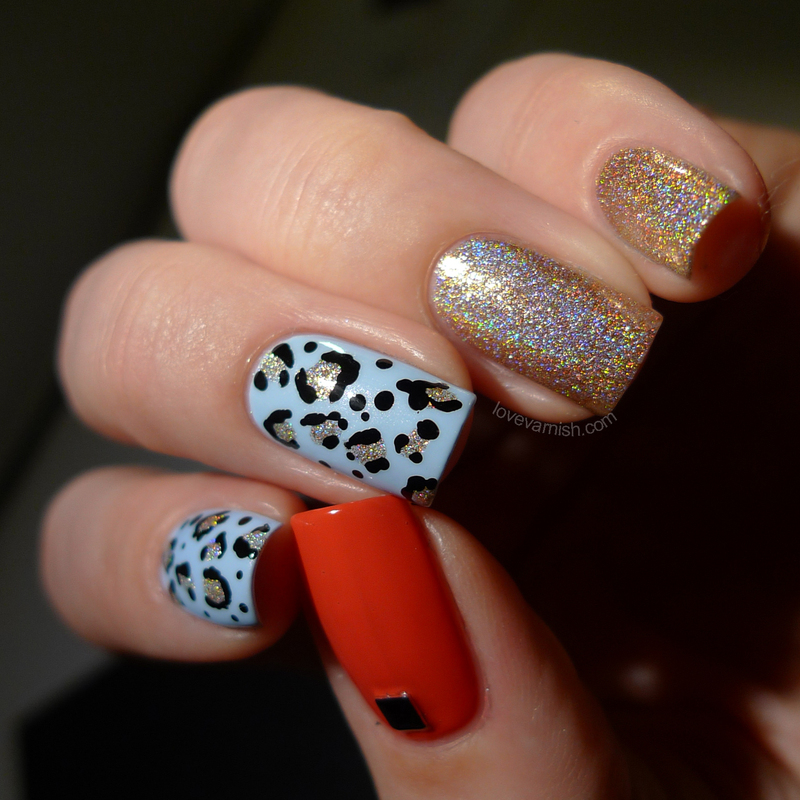 It's such a gorgeous golden holographic shade, and it also was great to use for the leopard spots. After the golden spots dried, I used a black polish and small dotting tool to create the edges. My thumb got painted with OPI Red Lights Ahead.. Where? because I wanted something bright and cheery to add to the "softer" colors. To tie in with the black I added a small square stud close to the cuticle. Everything was sealed with a layer of G&G HK Girl Top Coat and I am actually still rocking this manicure, it's just so cute! What do you think of this combination of shades and patterns? What would you have painted on the thumb nails? Tell me in the comments! Love this look!! You'd think it wouldn't be cohesive together, but it totally works! Thanks Jessica! I was a bit scared to paint my thumb red but somehow it works ^^! Thanks so much dear! This one lasted very well on me too, no tipwear after 2 days of wear and normally I have that after a day already :). This is so cute Deborah! 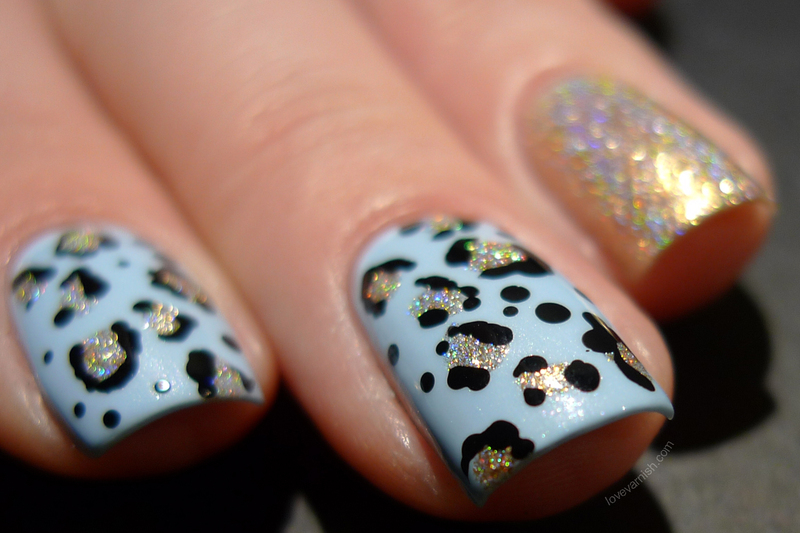 I love the holo in the middle of the spots! And I LOVE that blue! I want to see Maleficent so bad! Maybe I can convince my guy to see it soon! Thank you Angie ♥! I hope you can convince him because it's a fun movie! Thanks Lorraine, glad you do!